KATHMANDU, JULY 22: The reconstruction of Patan Darbar Square is likely to take four more years, according to workers rebuilding and renovating the historical and cultural monuments destroyed during the earthquake of April 2015. The Kathmandu Valley Preservation Trust (KVPT) had initially targeted to complete the reconstruction work in five years starting early 2016. But workers involved in the reconstruction said that it is not possible to rebuild the monuments within the given deadline largely due to a short supply of the right wood and wood carvers and artisans with skills and knowledge in Malla and Lichchhavi era architectures created around more than 1,500 years ago. The heritage of Patan Durbar Square was heavily hit by the earthquake. Around 250 cultural monuments including durbars, temples, patis and pauwas (wayside public shelters) were completely or partially destroyed during the earthquake. While some partially damaged structures like Krishna Temple, Bhimsen Temple, Visvesara Temple, Kumbeshwor and Radha Krishna temples have been rebuilt and renovated, the reconstruction of many other monuments like Char Narayan Temple, Hari Shankar Temple and two Mani Mandaps that suffered heavy losses is likely to take some more years. “It took us almost one year to rebuild the northern face of Sundari Chowk inside Patan Durbar. Besides that, we have so far completed around 60 percent of carving works at Char Narayan and Hari Shankar Mandir and two other patis,” said Tirtha Ram Shilpakar, whose team of 11 men, mostly wood carvers, is reconstructing the Durbar Square. It took nearly six months for the KVPT before coming across Tirtha Ram Shilpakar and his friends, who are all from Bhaktapur district. Shilpakar heads the team of 11 wood carvers who are paid a daily wage of Rs 1,500. 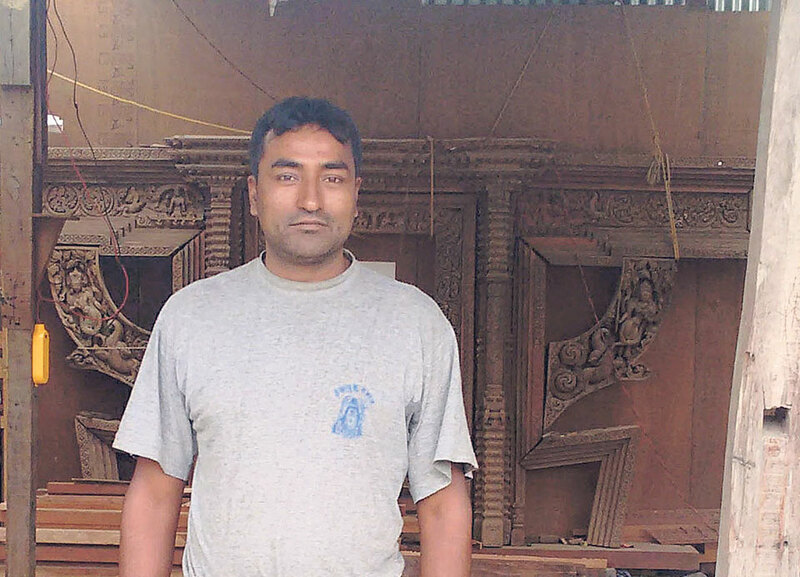 Despite his willingness, Shilpakar has not been able to expand his team due to the crunch of skilled wood carvers. “There are many in the town with wood carving skills. But having wood carving skills is not enough for such important reconstruction. This work requires a lot of passion and patience. One should give his heart and mind in the work. A rookie woodcarver can't do this,” said Shilpakar, who inherited the woodcarving skills from his parents. Shilpakars of Bhaktapur are the traditional woodcarvers in the Newari caste system. The art of wood carving dates back to the Lichhavi period. In his memoir, Chinese traveler Wang Hsuan Tsang, who travelled to Nepal in 643 AD, is full of praise for Nepali architecture and wood carving skills of Nepal. 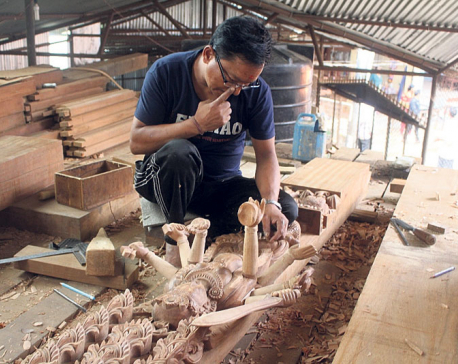 The shortage of workers with traditional woodcarving skills looks set to cause similar delays in the reconstruction of historical monuments in Kathmandu and Bhaktapur and the remaining areas of Lalitpur districts. 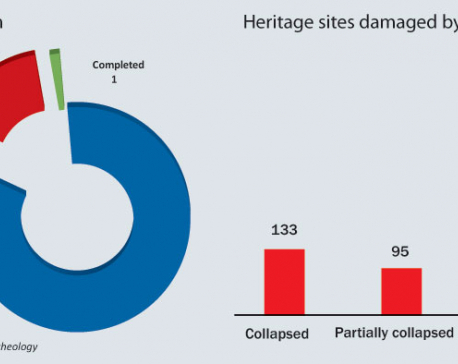 The earthquake has damaged more than 239 monuments in Kathmandu and 114 monuments in Bhaktapur. Besides few structures made of metal and wood, majority of those structures are wooden structures. 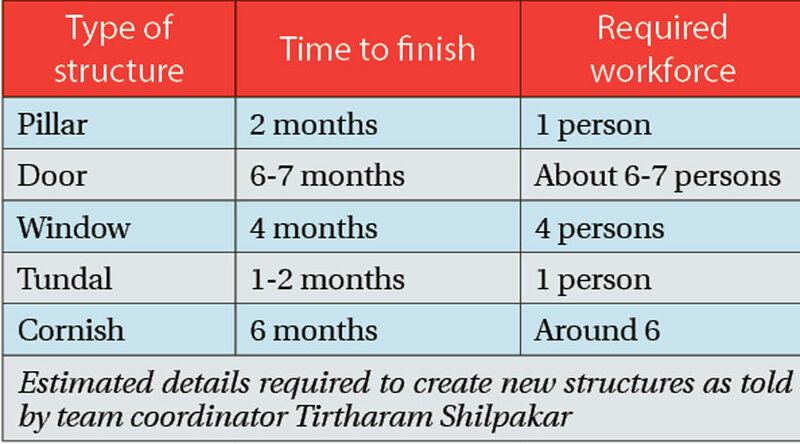 “Reconstruction and renovation works are taking place at a much faster pace in Patan than Kathmandu and Bhaktapur where the rebuilding of major sites is yet to start,” said Shilpakar. Like woodcarvers, the shortage of wood is also causing delays in the reconstruction of cultural monuments. Most of the heritages of the Kathmandu Valley are made of Dhunsi and Chansi, the best wood for carving due to their durability. These woods are also easy to carve. “Such woods are not available these days. Carvers these days mostly use Sal, Agrakh and Chap for carving,” said Kaji Man Pyakurel, head officer at the Office of Monument Protection and Palace Care under the Department of Archeology. While carvers have no issue with Agrath and Chap, they are not happy with the quality of Sal being provided for wood carving. The authorities are mostly using Malaysian Sal that carvers say is neither easy to carve nor durable. “We mostly prefer Nepali timber (Sal), but the suppliers are providing Indian and Malaysian Sal. Of them, Malaysian Sal is considered of inferior quality and hard to carve,” said Shilpakar.